An inebriated U.S. Senator Lindsey Graham humbly accepts the Republican presidential nomination. WASHINGTON (The Nil Admirari) - This morning, former 2016 Republican presidential candidate U.S. Senator Lindsey Graham of South Carolina accepted the Republican presidential nomination. An inebriated Graham gave his acceptance speech at what he claimed was the Corinth Tavern in Seneca, South Carolina. 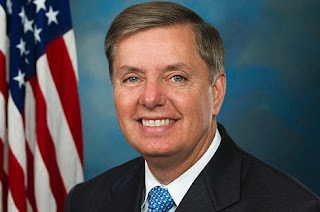 "I just received calls from Donald Trump and Ted Cruz, who both conceded the Republican presidential nomination to me," declared a slurring Lindsey Graham, who held a mint julep in his left hand and a bottle of Jim Beam in his right. Senator Graham continued, "Now let's crush Hillary Sanders and win the White House so I can unleash a disastrous series of wars around the globe, and further destroy personal liberties here in the greatest nation in the world." "Because real Americans sacrifice their liberties for a false sense of security... anyway, I'm very happy to make this announcement in the Corinth Tavern with so many close friends," explained Graham. An unidentified member of the press asked Graham if he knew he was in a church rather than a tavern, and that he was the only person there without press credentials. RELATED: Lindsey Graham Warns "We're All Gonna Die, We're All Gonna Die, We're All Gonna Die!" "That would explain the pews," replied Graham, who laughed before saying either John McCain or his sister would be his running mate. The Republican National Committee urged Republicans to fall in line behind Graham.